Ahh, the joys of driving a prototype vehicle. During the annual Toyota Sustainable Mobility Seminar in San Diego, California this week, Toyota brought in a handful of all-electric RAV4 EVs for us to tool around in, but there were some caveats: The route was decidedly highway-free; when it rained one afternoon, we were told it would be better to wait to drive the cars; and one journalist had a problem with his vehicle that made it sluggish. The biggest asterisk in the whole program, though, was that the RAV4 EVs we were testing are only a pale shadow of what the real RAV4 EVs will be like when Toyota releases them in the first quarter of 2012. Why's that? Because the current fleet of new RAV4 EVs was an intentional rush job by Toyota's partner Tesla Motors to get vehicles into auto shows and on the road. A completely separate batch is being built to really get this model ready for production, and it will operate differently than the ones we got to drive this week. Still, we learned a lot about what's coming by checking out what's here today. Here's how fast the new RAV4 EV has evolved. The Toyota/Tesla partnership was publicly announced in May of 2010, with the RAV4 EV program becoming public in July. 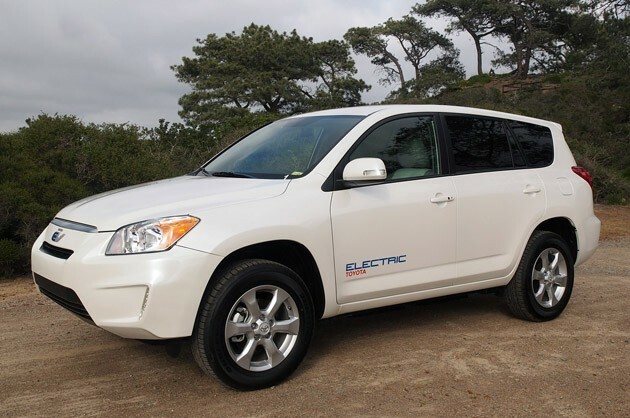 At the 2010 Los Angeles Auto Show, Toyota showed off the new RAV4 EV for the first time and Tesla delivered 31 prototypes to Toyota in February of 2011. This month, these vehicles were officially launched as part of a demonstration fleet. In the automotive industry, this is pretty close to light speed. Not that Toyota doesn't have a lot of practice with electric vehicles (heck, it was building the still-popular first-gen RAV4 EV a decade ago). In fact, the RAV4 EV was just one vehicle we learned about in California. Toyota's other announced electric vehicle plans include the following. The FCHV-adv, which is currently being developed and tested with a 100-vehicle demonstration fleet that started last year and runs through 2013. The H2 CUV is scheduled to arrive in 2015 "or sooner"
Okay, but we already knew about these other programs. Let's get to the RAV4 EV. First, some numbers. 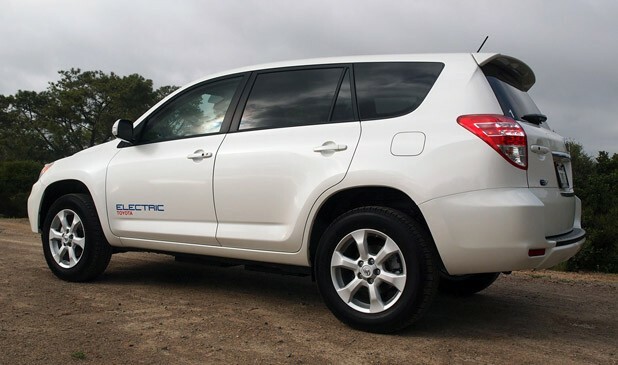 The RAV4 EV weighs 3,942 pounds, about 1,000 pounds of which are in the Tesla battery. The CUV can go from 0-60 in nine seconds. It has an official 100-mile-per-hour top speed (unofficially, test drivers have gotten it to over 103). The RAV4 EV has 73 cubic-feet of space, which is exactly the same as the standard RAV4 V6. Toyota is claiming a range that varies between 80 and 120 miles from the battery that has 37 kWh of useable energy. The engineers are guaranteeing that the RAV4 EV will beat the Nissan Leaf and its official EPA range of 73 miles. This is nice, but the RAV4 EV is bigger and heavier, an electron-guzzler or sorts, that gets just 2-3 miles per kWh (other EVs get around 4-5 miles), and we assume it will cost a lot more, too. Whatever the official range estimate ends up being, Toyota representatives told us that they will under promise and over deliver. The prototype has a Tesla charge port, but the production version will have the standard J1772 connector. The demonstration vehicles take ages to charge: 28 hours to fully charge over a standard 110 volt outlet (12 over 240V), but the production version, everyone promised us, will be "significantly improved." What is the deal between the prototypes and the pre-production models? The production version is really a separate project, and the two RAV4 EV teams are working concurrently. The production team is getting driving data, ideas and information from the test fleet team. In the light-speed rush to get Toyota some all-electric RAV4s, Tesla converted just 35 units for Toyota: two for development, two for the auto show circuit and 31 for the demonstration fleet. The team had carte blanche to choose the priorities for the EV version, but not enough time to completely refresh the vehicle for electric duty (as, for example, Volvo did with the C30 Electric and the redesigned safety features to protect the battery in case of a crash). So, a lot of the metal and parts come straight from a V6 RAV4, which is what all of these EVs started out life as, but there have been a few changes that were deemed feasible ways to enhance range. The electrified version has a new front fascia designed by CALTY in Newport Beach as well as "I'm an EV"-type badging and special LED fog lights. On the inside, the powertrain was imported, and slightly adapted, from a Tesla Roadster. There are at least four easy ways you can tell that this Toyota vehicle has been through the Tesla shop: the aforementioned Tesla connector, Tesla's battery management system box under the hood, the way the car gives you a little "Powered by Tesla" message when you start it up and the way the PRND buttons are arranged, which is similar to the way they are set up in the Roadster. Actually, five: the ability to drive (almost) with one foot. In all ways, this is a prototype vehicle. The special high-voltage disconnect switch you see in the dashboard picture is not something that will make it to production, so don't get too excited about that. Still, the way the RAV4 EV is today provides us with enough information to say that Toyota is on the right track here. The dash gives you the information you need – speed, kWh and battery state of charge and temp – in a clear display. 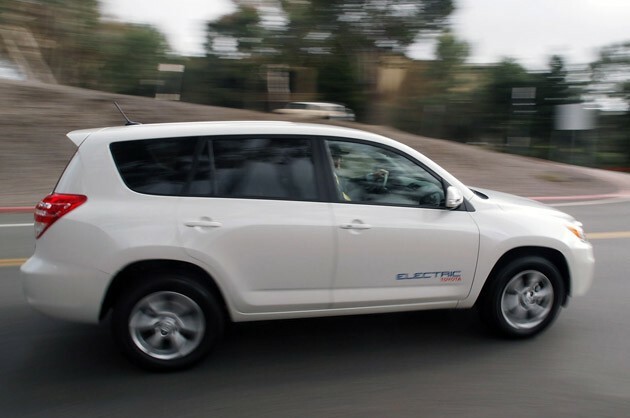 Most importantly, when you're moving along, the RAV4 EV feels incredibly solid, gliding through traffic just the way we want our silent electric vehicles to move. It's the part where you come to a stop that isn't exactly right. Right now, the regenerative brakes on the RAV4 EV are surprisingly intense. The brake lights do not turn on when you take your foot off of the accelerator, but they should given how harsh that regen grab is (it's somewhere between on a Tesla Roadster and a Mini E, for those of you who've experienced both of those vehicles). Some engineers apparently wanted to make the lights come on, but it was not technically possible with these quickly made vehicles. Roadster drivers who like the one-foot driving you can do in that car will feel right at home, although the RAV4 EV does have a slight creep, which means that stepping off the accelerator will never completely stop the car. Still, we fell in love with the coasting ability of the C30 Electric, and hope that, at the very least, Toyota allows drivers to choose their desired level of regen, but this is apparently a difficult task. We're going to have an in-depth look at this issue in a later article, so for now we'll just say that we're glad everyone we talked to said things will be different in the production version. 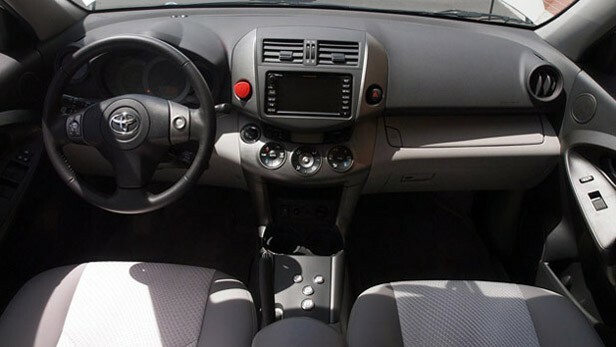 What's also not so useful and hopefully being changed in the production model is that the charging light is buried at the bottom of the center stack, right near the cup holders. A top-of-the-dash-mounted light like the Chevy Volt and Nissan Leaf have is much more useful. Given how fast Toyota got these vehicles from Tesla and then into journalists' hands, we're impressed with how far along the project is. In fact, when we first sat down in our RAV4 EV, there were just 61 miles on the odometer. Many more will have to be put on before everything's ready for the public, and we'd be happy help put on as many as Toyota will let us.